Health researchers confirm your ideal food intake includes 10 portions of fruit and vegetables a DAY and 3 portions of oily fish a WEEK. Most of us find it hard to meet these targets. That’s why NutriShield Essentials contains not just one, but THREE daily health supplements designed to “fill the gaps”. One-a-day supplements usually contain just the minimum recommended daily amounts (RDAs) of vitamins and minerals. But RDAs only prevent outright deficiency, while OPTIMUM levels can make a noticeable difference to health and energy. 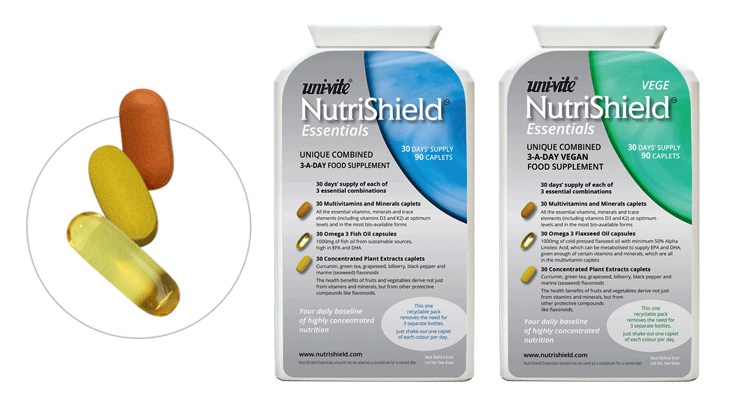 See why NutriShield Essentials has optimum levels. Omega 3 fish oil is important not just for heart health, but for joints and brain function.See why NutriShield Essentials has 1000mg a day of Omega3 oil. Omega 3 is important not just for heart health, but for joints and brain function. See why NutriShield Essentials has 1000mg a day of Omega3 oil. Concentrated fruit and vegetable extracts, including Curcumin, Green Tea, Grapeseed and Bilberry. Most of us find it hard to meet even the 5-a-day target for fruit and vegetables EVERY DAY, let alone more! See why NutriShield Essentials includes concentrated plant extracts to help towards these goals. The astonishing fact is that you make well over 50 BILLION replacement cells – a day! Each cell needs high-quality nutrition to stay healthy. Otherwise errors can creep in and multiply, and those errors can eventually lead to long-term illness. The nutrients in NutriShield help provide the building blocks for healthy cells. Uni-Vite is an established UK company marketing its own unique range of health and nutrition supplements.